OJ Simpson Gets The Boot! Once upon a time, a guilty man got away with murder. Then he said he would spend his days searching for the real killer. First his search took him to the golf courses. Now his search has led him to the Kentucky Derby, where last Friday, OJ Simpson was asked to leave an upscale steakhouse in Louisville, Kentucky. The steakhouse owner then went over to Simpson’s table, where the ex-NFL star sat with about a dozen other people, and announced, “I’m not serving you.” Simpson did not respond, so Ruby repeated himself and walked away. 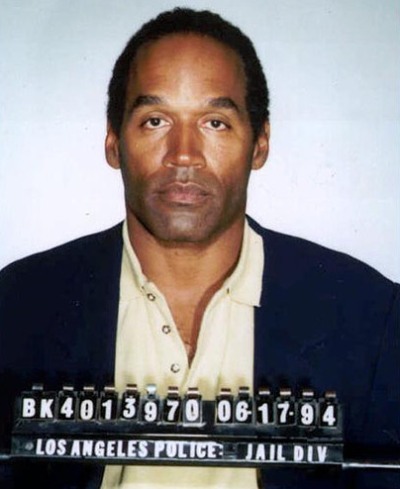 OJ soon approached Ruby, said he understood and he and his party would leave. But of course, it doesn’t end there. Simpson’s lawyer, Yale Galanter, has gotten into the mix, saying that the incident is about race and that he intends to see the matter through and maybe even go after the restaurant’s liquor license. “[Jeff Ruby] screwed with the wrong guy, he really did,” the ranting attorney said by phone Tuesday. After OJ’s departure, the steakhouse patrons gave the owner a round of applause, and he has since received about 100 positive emails. Among the celebrity photos that line the restaurant’s walls, there used to be one of Simpson and Ruby, but it was taken down shortly after the killings. previous post: Yes!! Paris Hilton Is Going To Jail! next post: Hey Paris Hilton! Would You Like Some Cheese To Go With Your Whine?